As global benchmarks continue to edge lower over time, European equity indices have not been omitted from the carnage. With many regional indices operating in bearish market territory, the outlook looks grim for European corporates as the ongoing deceleration of global trade and weak sovereign fundamentals continue to weigh on valuations. This is especially true for France, where macroeconomic conditions continue to largely stagnate as the nation enters another year of fiscal austerity amidst a weak growth backdrop. 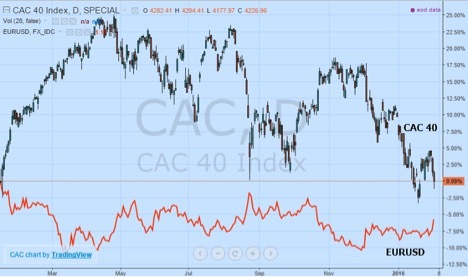 Despite accommodative policy measures from the European Central Bank (ECB) stoking speculation of added stimulus, French shares have failed to react positively to the developments, with the CAC 40 index trading firmly bearish territory. Even though optimism was abundant towards the end of January following an ECB meeting that foreshadowed expanded easing measures, conditions in France remain weaker than other comparable peers in the economic bloc. Unemployment remains a far cry from other advanced economies, currently sitting at 10.60% and outpacing the aggregate Euro Area figure of 10.40% while the government continues to run a budget deficit, currently estimated at -4.00% of GDP, meaning that austerity measures are likely to stay intact over the near-term. There are some bright spots, namely the uptick in annualized GDP growth and the positive expansion emanating from the manufacturing and services purchasing managers’ indices. However, from the perspective of stocks, weak fundamental conditions continue to translate to softer wage growth and anemic expansion in spending. Wage growth is a key driver of disposable income for consumers and margin expansion for regional corporations, meaning that if wage growth remains at 0.20%, all gains will be eaten up by inflation at the same rate. Headline inflation is another key risk factor, with the figure still weaker than the remainder of the economic bloc, raising the specter of deflation despite the Central Bank’s best efforts to fight falling prices. Generally speaking, the outlook for the CAC 40 is neutral considering the numerous tailwinds adding to potential upside. With the ECB actively working to keep financial conditions attractive in the Monetary Union to stoke growth and fight deflation, regional companies should be able to benefit from lower borrowing costs and a more competitive currency. Moreover, a weaker euro should stimulate exports to a degree. Even though the recent rally higher in the currency might eat away at the competitive advantage from an export perspective, the Central Bank looks increasingly likely to add more quantitative easing in the upcoming March meeting, bringing the size of monthly purchases from the current €60 billion to an anticipated €75-80 billion. This added liquidity has historically found its way towards stocks, however, worsening global conditions may change fund flows. Aside from growing risk aversion amongst investors, from a structural perspective, the French economy continues to be burdened by austerity measures and weak reform efforts. In spite of growing calls for altering cumbersome regulations and laws, actions have been fleeting. A strong desire to modify existing labor policies and improve competitiveness has been met with no progress. Although the government highlighted its willingness to adjust working hours and discuss easing rules that make firings and layoffs especially challenging, policymakers have failed to implement the suggested changes, dragging further on job creation. 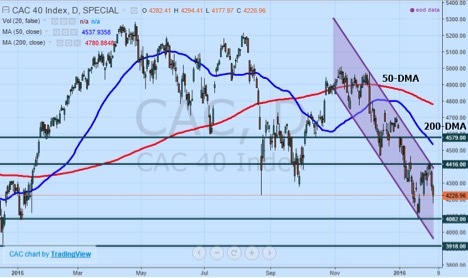 From a technical point of view, the French CAC 40 has a number of factors dragging on performance. For one, the recent ascension in the euro continues to put pressure on French equities, making them more expensive on a relative value basis. Although not perfectly correlated, the inverse relationship between the two means that any substantial move higher in the euro over the coming sessions is likely to translate to added downward momentum for French stocks. Adding to the momentum is the overwhelming bias emerging from technical indicators such as the 50 and 200-day moving averages, which are currently trending lower. Both are currently acting as resistance against any sustained gains in the CAC 40 benchmark. Adding to the current bearish bias in the CAC 40 is the ongoing downward trending equidistant channel formation that has been setting up since November. 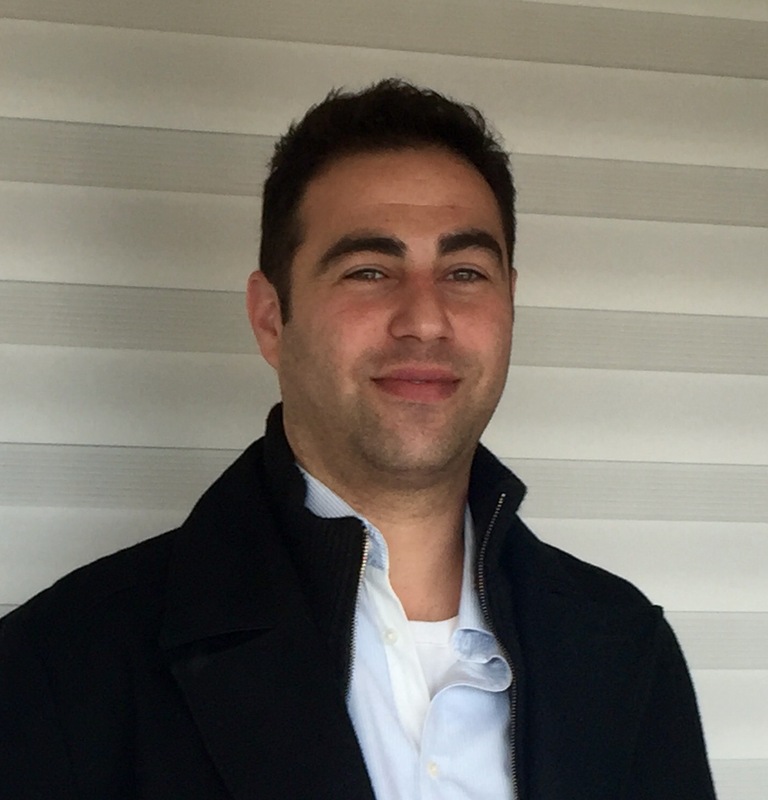 Although prices are currently trending in the middle of the channel, the prevailing strategy is to establish short positions at the upper bound of the channel with the target of the lower bound. Fighting the downward momentum with long positions remains unwise due to worsening reward conditions and expanded risks, however, a candlestick close above the upper channel line could indicate a channel-based breakout higher. The next target on the downside is support and 52-week lows at 4082 with any break below this critical point paving the way towards 3918. Should an upside breakout and rebound come to fruition, the resistance sits firmly at 4416. The combination of weak structural reform efforts and lacking competitiveness continue to remain a very real drag for French equities at a time when there are numerous positive factors to support valuations. Accommodative monetary policy from the Central Bank absent complementary fiscal policy from the local French Government means that benefits from loose policies are limited. Expanded easing measures expected to be announced in March could add to upward momentum in European indices and the CAC 40, however, should policymakers be unable to tackle high unemployment and structural deficiencies in the economy, this momentum will fizzle quickly. The main strategy over the near-term remains fading any subsequent rallies in the CAC 40, with ideal positions capitalizing on the sustained downward momentum in global equity indices.